Jabi shows us a fun & easy Caramel Popcorn recipe. Melt butter in large pot on medium heat then the rest of the dry ingredients, syrup & vanilla essence stirring constantly. Turn off heat. Pop popcorn & drizzle caramel over popcorn, carefully stirl to cobine. Dip a fork in the remaining caramel mixture & lift to create decorative spun sugar. 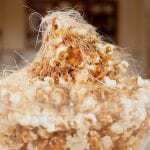 Top popcorn with spun sugar.